Home health is one of the fastest growing career fields in New York and the United States. As people are living longer and prefer to live at home rather than a nursing home or some other form of the institution the need for personal assistance grows. As the family dynamic has changed as more people are in the workforce rather than in the home taking care of their aging family members, the need for home health aides will continue to increase. This offers a great opportunity for millions of Americans who are searching for stable careers. If you have not done so already, read through our other posts that provide more information about the benefits of careers in home care, reasons to pursue a career in home health, and roles and expectations of caregivers, we strongly encourage you to take a few moments to do so. At Angels on-Call Homecare, we are a home health agency that provides a wide variety of medical and personal care services to our patients in their homes. We have a great need to build our team as our patient list grows. We provide ongoing training, support, and opportunities for growth. 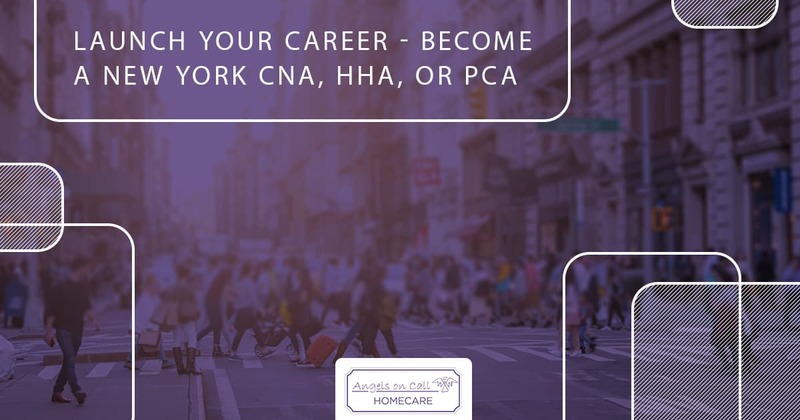 Join us today as we discuss how you can become a CNA, HHA, or PCA in New York and launch your career with Angels on-Call Homecare. Even if you are already vaguely familiar with the medical field, all of these acronyms can seem like a jumble of letters, so let’s clarify. HHA – Home Health Aide. PCA – Personal Care Aide. The difference between these roles is a matter of training, certification, skill level, and level of responsibility. 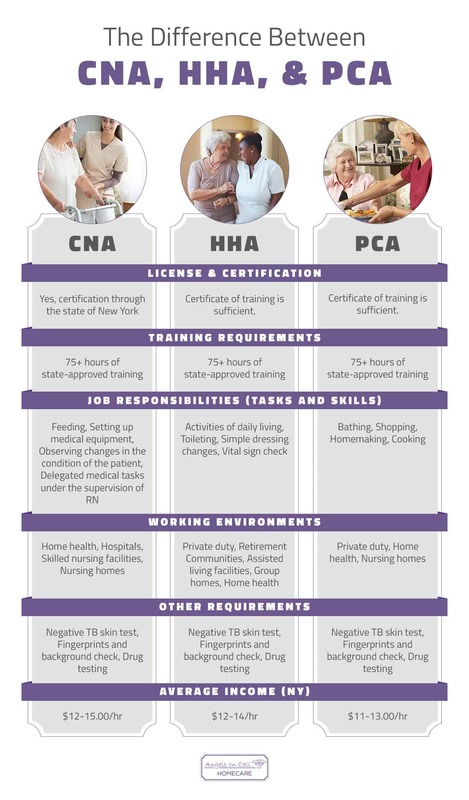 Certified nursing assistants (CNA) must undergo formalized training that is monitored and maintained by the New York State Department of Health. Training culminates in an exam and certification. CNAs are able to do personal care tasks such as feeding, bathing, toileting, transferring, and grooming, in addition to medical tasks such as managing oxygen supplies and assistive devices, changing simple dressings and caring for skin, measuring vital signs, monitoring intake and tending to diet regimens, observing changes in patient conditions, and other medical tasks under the supervision of a Registered Nurse (RN). CNA certification can transfer to other states and may offer a solid foundation for those pursuing a career in nursing. Like CNAs, home health aides (HHA), can do all personal care tasks, in addition to simple dressing changes and vital signs checks. Becoming a home health aid offers training and certification that is recognized by the state of New York and offers the HHA a higher income than other positions. For more information about becoming a CNA or an HHA in New York, read here and here. A personal care aide (PCA) handles housekeeping and personal care needs but does not handle any medical responsibility. PCAs generally act as personal assistants or companions to their patients. PCAs can accompany patients on errands, participate in activities, and prepare food for their patients. PCA is a great career opportunity for those who have experience taking care of others, such as their own children or family members, and are looking to make a living caring for others. 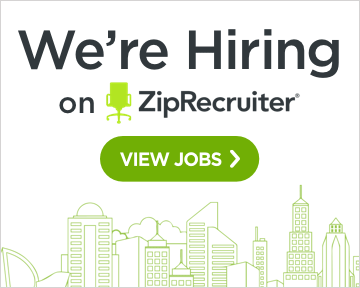 At Angels on-Call Homecare, we have job openings for CNA, HHA, and PCA in Westchester, Putnam, and Dutchess counties. Whether you are looking for full time, part time, or temporary placement, we have the schedule to fit your lifestyle. We are proud to offer excellent benefits. Become an angel for someone who needs your talents; apply online today!